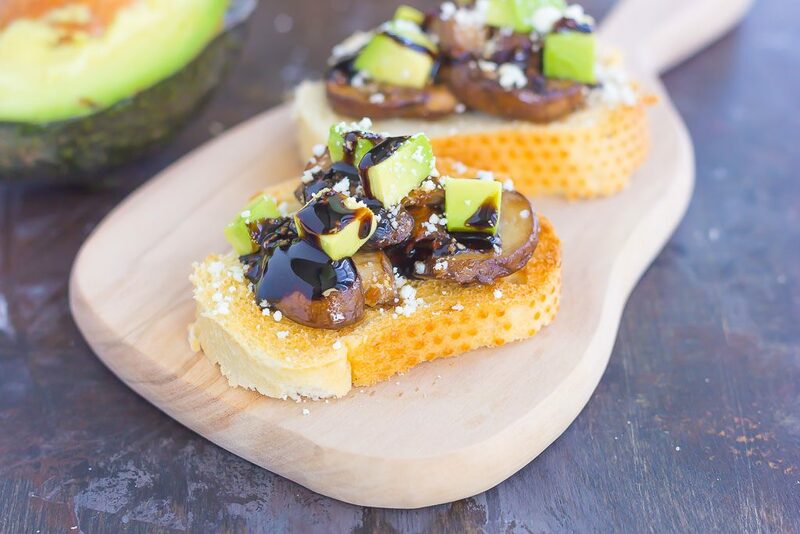 This Mushroom, Avocado and Feta Toast combines fresh mushrooms, ripe avocado and creamy feta cheese, piled high on toasted bread and drizzled with a balsamic glaze. 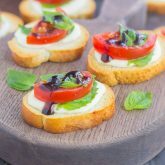 This simple toast makes a deliciously easy appetizer or side dish! Can you believe we’re already at the end of June? The summer feels like it’s flying by, and we just got started. I’ve mentioned this before, but one of my favorite things about summer is the farmer’s markets in my area. I absolutely love browsing through their fresh selection of fruits, veggies, and other goodies. It just screams summer and all things deliciousness! Though there are many different farmer’s markets in my area, I usually go to the same one or two, just for convenience sake. And one thing that I usually load up on every week (besides ALL the fruit) is avocados. I usually have a hard time picking out avocados from my grocery store, as they’re either too mushy, too hard, or just plain gross. But when I see the selection at the farmer’s market, I feel a lot better about my decision. After all, picking a ripe (and delicious) avocado takes some skill, at least for me! So, of course I headed home and had to whip something up with the ten billion avocados I hoarded. And you know me, I loooove mushrooms (see here, here and here), so this seemed like a natural fit for some avocado toast. And feta, because you can’t forget the cheese. Or the balsamic glaze. It adds the finishing touch and the perfect amount of flavor for each bite. 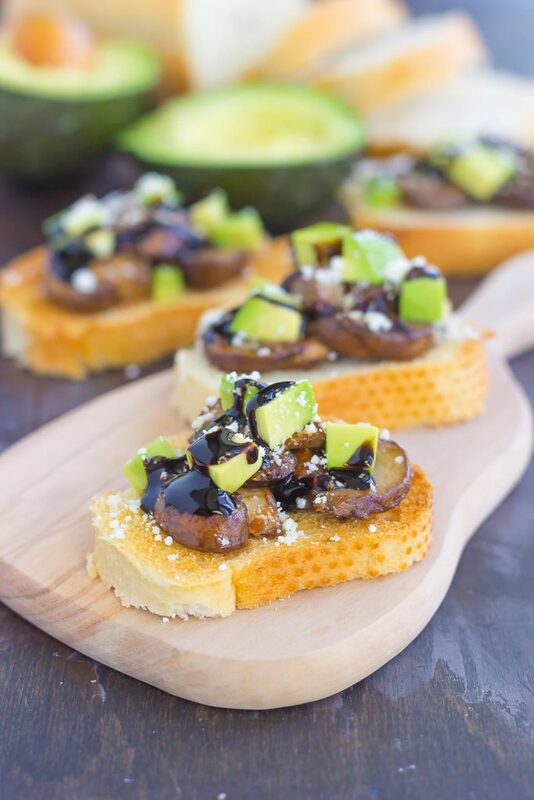 This Mushroom, Avocado and Feta Toast is so easy to whip up! But, you knew that was coming, right? I used a french baguette for the bread, but feel free to use whatever you have on-hand. I popped it into the oven to broil for a few minutes, just to get that nice, golden, crispy texture. Next comes the mushrooms! I sauteed them in some olive oil, garlic, salt and pepper. Easy peasy! Once the toast is ready, pile on those mushrooms, add some chopped avocado (or sliced, if you prefer! 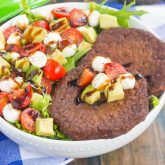 ), a sprinkling of crumbled feta, and a touch of balsamic glaze. And to make things even easier, I used the bottled glaze that you can find near the olive oils in your local grocery store. One bit and you’ll be hooked on the savory flavors. 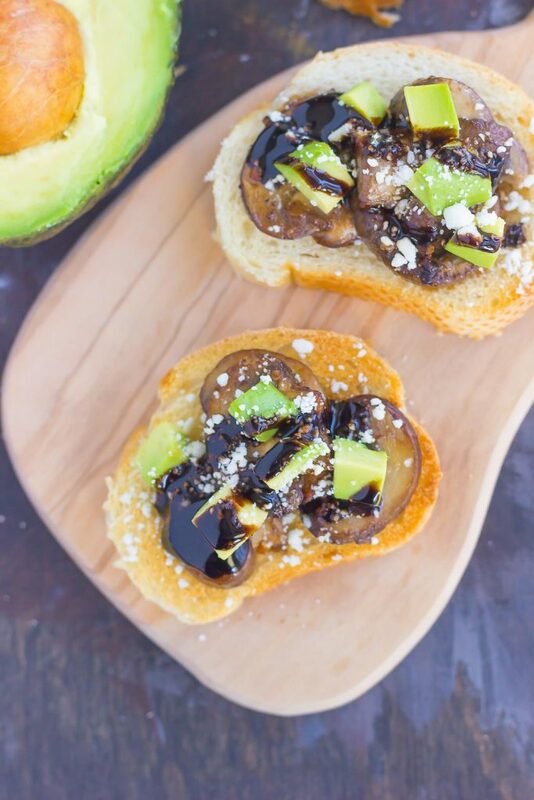 The seasoned mushrooms, the creamy avocado, the bite from the feta and balsamic glaze…what could be better? This toast makes a delicious appetizer, side dish, or, if you’re like me and eat it all, a main dish! But whatever your preference is, this Mushroom, Feta and Avocado Toast is a must-make for the summer. It’s’ fresh, fast, and easy. Plus, it just has summer written all over it! Heat a large skillet over medium heat. Add olive oil and garlic. Saute for 1 minute. Add mushrooms and saute for 6-8 minutes, or until golden. Season with salt and pepper. While mushrooms are cooking, place sliced bread onto a large baking ban. Broil on medium heat for 3-4 minutes, or until bread starts to brown. 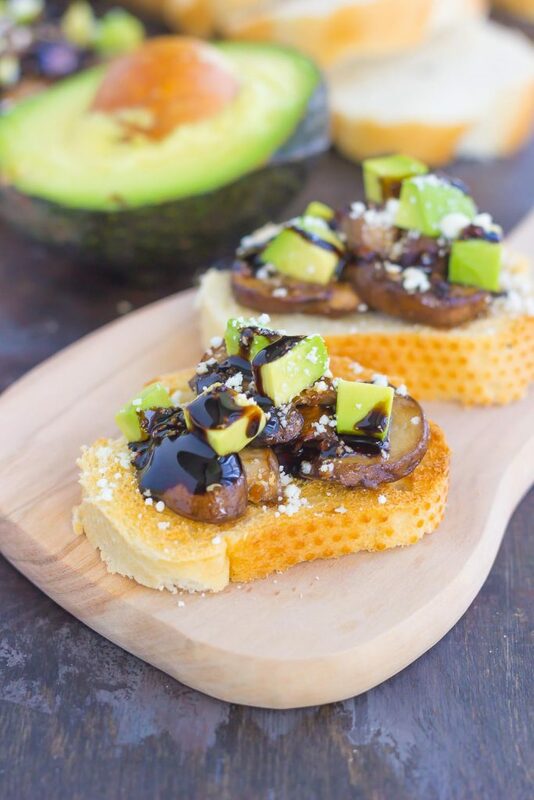 Spoon mushrooms onto each slice of bread, followed by diced avocado, and feta cheese. Garnish with a drizzle of balsamic glaze on each slice. I use the bottled balsamic glaze that you can find by the olive oils in your local grocery store. I am so ashamed to say I have YET to go to the farmer's market this summer! I feel self deprived!! But, in my defense, things have been super crazy over here. We spent the weekend moving some of our things into the new house, but once we are fully moved in and things have settled down the farmer's market and I have dates on repeat! ;) LOVING this toast!! I remember when toast was just bread and butter, and now toast is so fancy! This one looks just delicious! I love how hearty it is, yet still light and super healthy! I could use a few slices of this right about now! Pinned! Cheers, friend! You have a good excuse for not going...your new house! Yay! :) Thanks for the toast love and pin, friend! Aren't farmers markets the best?! I could eat avocados every day, too. Thanks, Dawn! Thank you, Deborah! 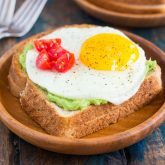 Savory breakfasts are so good! 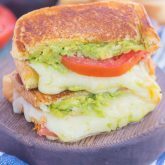 This would make the perfect quick summer lunch with some extra fruits and veggies! Such a fun idea Gayle! That is strange that your farmer's market doesn't have avocados! Thanks for the toast love, Marcie! I can't believe 4th of July is next week. And I've been to the Farmer's Market just once so far... I'll start going every week :) These toasts look amazing and I can't with to try them! Mushrooms are my favorite! This summer is flying by! Thanks, Mira! We can never have too many exciting appetizer recipes, especially for the summer months! These look delectable, my friend! Pinned! Oh my goodness...sauteed mushrooms + avocado in one bite?! My heaven! I've never seen an avocado at our farmer's market...so jealous that you have them in your neck of the woods! I bet they are AH-MAZING! Thanks, Blair! Mushrooms and avocado make the best combo! I love small bites and these have all of my favorite flavors. Love this idea Gayle! I could make a meal out of this! Love the drizzle of balsamic on top! Ugh I've been so annoyed lately with the avocados at my grocery store - they are all complete mush!! So not cool! haha Anyway, these toasts sound soooo good!! Between my garden and my local farm, my fridge is packed with summer produce! I just love it. I love these mushroom, avocado, and feta toasts, Gayle. It's all of my favorite things together! Yay for summer produce! Thanks, Keri! I love this combination ??? ?